Unlike many other rosaceous fruit crops, commercial raspberry cultivars are largely self-fertile and mostly self-pollinate autogamously. However, their floral morphology does not allow for complete autopollination, which often yields unmarketable small or crumbly fruits. Insect visitation is therefore essential to maximize raspberry production. Honey bees are typically used to pollinate commercial raspberries, but escalating prices for hive rentals coupled with increasing acreage encourages evaluation of other manageable pollinators. Four other manageable bee taxa—various Bombus spp., Osmia lignaria Say, Osmia aglaia Sandhouse, and Osmia bruneri Cockerell—are all promising raspberry pollinators. Because honey bees remain the least expensive option on a per forager basis, adoption of an alternative pollinator should entail some other advantage, such as superior pollination efficacy. In this study, we compared honey bees with these other bee species for their pollination efficacies at red raspberries, measured as the number of drupelets resulting from a single visit to a virgin flower. Each species’ single-visit pollination efficacy was also compared with drupelet set from both unvisited and hand-pollinated flowers, and their pollination effectiveness scores were calculated. All five bee species were equally effective raspberry pollinators; therefore, honey bees remain the most cost effective option for open field pollination of raspberry. Mason bees and bumble bees may have greater utility during cool weather or for protected cultivation systems, contexts unfavorable to honey bee foraging. Bee visitation increased drupelet set two- to four-fold regardless of bee species or raspberry cultivar. All five bee species proved to be excellent pollinators of raspberry, with a single visit by either A. mellifera or O. lignaria sufficing to maximize drupelet set for some cultivars. A single visit by the least effective overall pollinator, O. bruneri, still resulted in >70% drupelet set compared with ~35% set for unvisited flowers. Our results suggest that as few as two visits by any of these bees should suffice to maximize drupelet set by raspberry (Table 1). All visits recorded in this experiment were to virgin flowers containing copious amounts of nectar. This is relevant for interpreting our results, as visit duration scales with nectar quantity (Bekey 1985, Willmer et al. 1994), and drupelet set is proportional to the duration of a bee’s floral visit (Chagnon et al. 1991). Therefore, although objectively estimating relative pollination at virgin flowers, these results may overestimate pollination efficiency of these bee species during subsequent visits to once-visited raspberry flowers. We hypothesized that honey bees would be less effective than mason bees and bumble bees as pollinators of raspberry, due to differences in the bees’ behaviors and how they interact with flowers. Contrary to our expectations, we only observed minor differences in drupelet set among bee species. Bumble bees deposit significantly more pollen on individual raspberry stigmas per visit than do honey bees (Willmer et al. 1994, Sáez et al. 2014); however, the number of drupelets per fruit did not vary significantly with stigmatic load (Sáez et al. 2014). We posit that, in terms of overall drupelet set for a berry, the number of stigmas receiving pollen is more important than the number of pollen grains placed on an individual stigma. If true, then behavior of the bee on the flower should be of greater consequence than its per-visit pollen deposition. By that reasoning, bees that contact more of the stigmas within a flower are likely to be more effective pollinators. On a per-forager basis, honey bees are less effective pollinators than Bombus and Osmia bees at several other rosaceous fruit crops, including almond (Bosch and Blas 1994), apple (Vincens and Bosch 2000), and pear (Monzón et al. 2004). This difference is largely attributed to their foraging objective and positioning upon the flower. Honey bees that gather pollen are usually better pollinators than nectar foragers (Bosch and Blas 1994, Monzón et al. 2004, Vincens and Bosch 2000, Willmer et al. 1994). When collecting pollen from these tree fruit crops, honey bees land atop flowers, where they regularly contact the central stigmas and effect pollination. More commonly, foraging honey bees seek just nectar, which they often collect by ‘side-working’ the flowers, walking around the petals while probing the nectaries through gaps at the base of the androecium (Vincens and Bosch 2000). During such visits, the bee fails to contact the stigmas (Bosch and Blas 1994, Monzón et al. 2004, Vincens and Bosch 2000). In contrast, Bombus and Osmia typically work the flowers from the top, regardless of foraging task, nearly always contacting the anthers and stigmas (Bosch and Blas 1994, Cane 2005, Monzón et al. 2004, Thomson and Goodell 2001, Torchio 1981, Vincens and Bosch 2000). Honey bees remain the primary commercial pollinators of these crops because they can be affordably provided in great abundance. At raspberries, bumble bees are twice as likely as honey bees to forage for pollen, although the consequences of this difference in foraging propensity are not known for Rubus pollination (Willmer et al. 1994). Mason bees are also far more likely to forage for pollen at Rubus flowers (Yokoi and Kandori 2016), and Cane (2005) noted that O. aglaia stands astride the central pistils when visiting Rubus flowers, ensuring contact with all the stigmas. In contrast, nectar-foraging honey bees at openly visited raspberry flowers were often seen walking in a circle around the nectaries, thereby failing to contact the central-most stigmas (Cane 2005). We were therefore surprised that pollinators differed little in their handling of raspberry flowers. This might be due to the small size of raspberry flowers relative to those of apple or pear. Honey bees often approached virgin raspberry flowers from the side to probe the outer ring of nectaries, but inevitably they would then reach their heads or bodies across the flower to drink nectar, an action enabled by the smaller size of a raspberry flower. Nonetheless, honey bees did not pollinate cultivars equally well. They were poorer pollinators of ‘Royalty’, although still setting >50% of drupelets (Table 1). This contrast may reflect cultivar differences in floral morphology or nectar abundance that alter bees’ handling behaviors. Honey bees’ tendency to side-work apple flowers varies with floral dimensions (Benedek and Nyéki 1996, Thomson and Goodell 2001). The purple raspberry ‘Royalty’ is a hybrid of red (R. idaeus L.) and black (Rubus occidentalis L.) raspberries and may therefore have a floral morphology sufficiently different from the red raspberry species to explain the discrepancy in honey bee’s pollination efficacy. The mason bees and bumble bees in this study approached flowers as expected, alighting on and working from atop the central pistils. The most striking difference in flower handling was in the way O. bruneri groomed pollen from its body during floral visitation. Slow motion video revealed bees briefly hovering above the flower to transfer pollen to their scopa using their hind legs, then landing again to resume foraging. As a result, a single visit by an O. bruneri to a raspberry flower actually consists of several shorter visits in rapid succession. Drupelet set resulting from O. bruneri visits had a larger variance than that of other bees in the study, perhaps because they periodically hover to pack pollen, thereby interrupting their visit. Contact time with the flower, which is directly related to drupelet set (Chagnon et al. 1991), may vary more per visit for O. bruneri than for bees that remain on the flower for the duration of their visit. Although it was not directly observed behaving in this manner, O. aglaia had a similarly higher variance in drupelet set. These two like-sized species are closely related and may, therefore, share this distinctive grooming behavior (Basibuyuk and Quicke 1999). In our study, no species greatly outperformed honey bees in single-visit efficacy. Despite rising colony rental prices, honey bees therefore remain the most economical and practical option for open-field raspberry pollination. The price of bumble bee colonies has dropped dramatically as rearing methods have improved (Velthuis and Dorn 2006) such that their purchase prices are now comparable to a honey bee hive rental. However, honey bee colonies can field thousands more foragers than a bumble bee colony. Mason bees are even more expensive than bumble bees on a per-forager basis. Of the three species examined here, only O. lignaria is currently commercially available, costing about US$1 per female, too expensive unless a grower can multiply them on-farm. Although honey bees remain the best option for open-field raspberry production for now, the price differential between them and other bees may close in the future. In Scotland, bumble bees are being used for open-field pollination of raspberries (Lye et al. 2011). The economics of using Osmia is not yet demonstrated on commercial raspberries. Alternative bee species may instead find greater utility pollinating raspberry grown in high-tunnels and greenhouses. Bumble bees and mason bees fair better than honey bees in confined spaces and under U.V. light altering plastic film (Pinzauti et al. 1997, Morandin et al. 2002). Honey bees visit fewer raspberry flowers growing in high-tunnels compared with open-grown plants on the same farm (Neilsen et al. 2017). Honey bees may need to be more densely stocked to pollinate in high-tunnels; that added cost favors alternative pollinators that readily forage in in this setting. The current lack of a commercially available western U.S. bumble bee precludes their use for most high-tunnel production. In contrast, all three species of Osmia in this study are native to the western United States and, even in confinement, proved capable of effectively pollinating and reproducing on raspberry. In Italy, a European mason bee, O. cornuta, also reproduced well while effectively pollinating high-tunnel blackberry (Pinzauti et al. 1997). 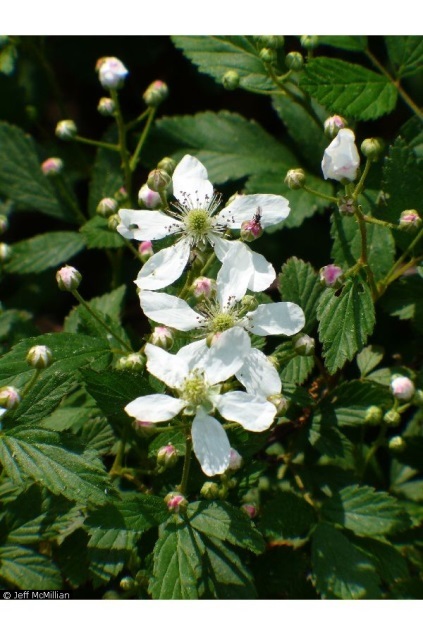 Mason bees are, therefore, an excellent candidate for high-tunnel Rubus production. They also show promise as pollinators of greenhouse-grown raspberry. Our study is the first to demonstrate that O. lignaria flown in a glasshouse effectively pollinates raspberry. Currently, bumble bees are the sole pollinator recommended by production guides for greenhouse pollination (Pritts et al. 1999, Dale et al. 2012). More information on the required stocking densities of Osmia for greenhouse pollination is needed, but mason bees may be an economical alternative to bumble bees for greenhouse production of summer-bearing raspberries. However, bees with a different seasonality may be needed for late summer/autumn raspberry pollination. Comparative studies, such as this one, are a first step in discovering alternative manageable pollinators for fruit crops. Our direct measure of single-visit efficacy contradicts previous claims that bumble bees outperform honey bees as raspberry pollinators. We conclude that honey bees remain the best option for open-field pollination of raspberry. Our results accurately represent the relative single-visit efficacy of the five bees studied here, but overall performance includes other traits, such as crop fidelity, visitation rate, activity patterns, and interspecific interactions (Rogers et al. 2013). Incorporating these additional traits may ultimately reveal differences in pollination value sufficient to justify the adoption of one of these alternative bees for raspberry pollination.